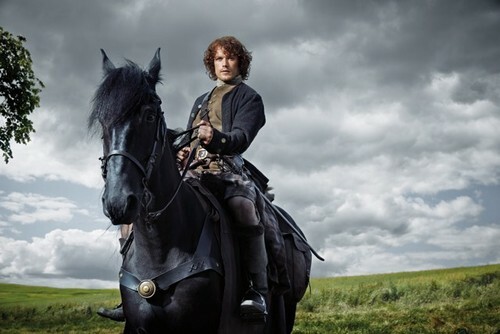 Outlander - TV Guide. . Wallpaper and background images in the outlander série de televisão 2014 club tagged: photo outlander tv guide sam heughan jamie fraser. This outlander série de televisão 2014 photo contains lippizan, lipizzan, lippizaner, trail cavalo, trilha do cavalo, wrangler cavalo, wrangler, wrangler de cavalo wrangler, and cavalo wrangler. There might also be com brio, puro sangue, puro-sangue, packhorse, and cavalo de carga.